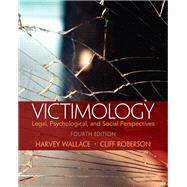 Victimology: Legal, Psychological, and Social Perspectives, 4e is a student-friendly, easy-to-read text that covers the field of victimology. Fully updated with the latest trends, it reflects the field’s growing focus on the entire victim-offender relationship, while taking a global perspective on the study of victimology. The text is divided into four major areas. The authors first introduce traditional victimology theories, the measurement of crime, and both civil and criminal processes. (Civil process is included because it is an important aspect of the victim—offender interaction.) Second, they discuss responses to victimization, including techniques for empowering victims. They next turn to special types of victims, including the elderly, the disabled, and gay and lesbian victims. Finally, they thoroughly review the civil remedies available to crime victims. A brief discussion of the juvenile system is also included because more attention is being focused on youth violence. Throughout the text, key concepts are supported with a comprehensive package of pedagogical material and teaching/learning aids.